As you continue reading you will come to know that Calista is truly one of the great values in Pinot Noir today, Explore, learn, taste. The “Coastal Range” is a concept that Calista has embraced. 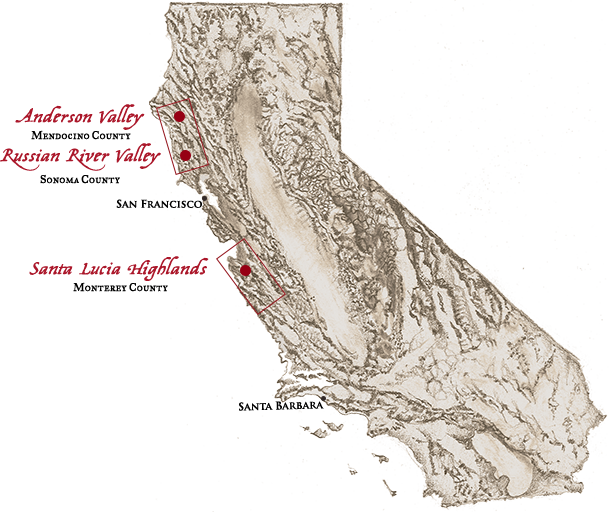 It represents a collection of the best growing regions and best vineyard sites for growing Pinot Noir, ranging from Santa Barbara south, to Mendocino north. This vintage of Calista is sourced from vineyards in the Santa Lucia Highlands in Monterey, Russian River in Sonoma, and Anderson Valley in Mendocino counties. The very pretty and savory fruit from Anderson Valley truly holds the Coast Range blend together. It balances the strength of the fruit from Santa Lucia Highlands and the bright fruit from the Russian River Valley. Anderson Valley boasts an eclectic variety of soil types that range from loam and clay to gravel beds. Anderson Valley is also home to a notorious marine layer that retreats back up the Navarro River in the late morning. These attributes shape a unique terroir that many believe is the most Old World like Pinot Noir grown in the New World. The Russian River Valley’s striking richness of fruit, like Calista’s Arrow, gives the overall direction to the Coast Range Pinot Noir. The valley’s cooling fog heads inland off Bodega Bay and up through the Petaluma Gap causing diurnal temperature swings of 35°-40°. The vines root themselves in the ancient alluvial soils of the Russian River Valley’s floodplain. This marriage of cooling fog and distinct soils exemplifies the Coast Range Pinot Noir. Calista aimed to have their wines typified by focused and bright fruit tones that span the flavor profile from red strawberry to dark cherry with mixed spices and earth tones. The team at Calista refers to the qualities the Santa Lucia Highlands fruit imbues on their wine as Calista’s Bow, due to the strength and structure they give to their blend. Planted on the eastern facing terraces of the Santa Lucia mountain range, this growing region enjoys morning and afternoon sunshine. However, it is the Santa Lucia Highlands southeast orientation that funnels cool wind off of Monterey Bay and down the warm Salinas Valley. This creates the needed cooling for iconic Pinot Noir. The cooler temperatures combined with the sandy loam soils produce rich, voluptuous, dark berry flavors that frame our Coastal Range Pinot Noir. The 2012 Calista Coast Range Pinot Noir is deep ruby red in color with aromatics of dried cherries, rose petal, violet, and roasted coffee bean. Rhubarb, cherry and notes of cranberry flow through the palate to a balanced and lengthy finish of mixed dark fruit and black tea.